Fire Doors Market size is estimated to surpass USD 16.5 billion by 2024; according to a new research report by Global Market Insights, Inc. Rising count of fire incidences along with growing construction sector are propelling the global fire door market share. Favorable government regulations towards reducing the fire incidences will support the industry demand over the next few years. Additionally, government focus on providing exit passageways for people in case of residential fire incidences along with obligatory installation of fire doors in public and commercial buildings will stimulate the business expansion. 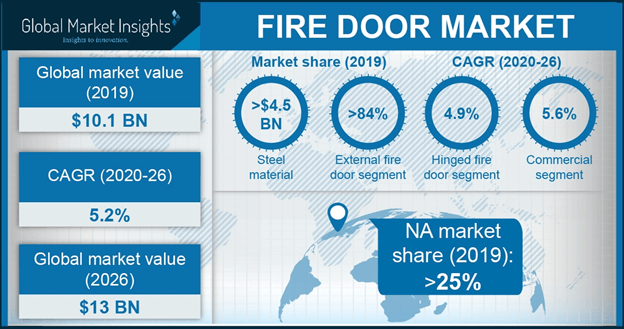 Steel fire door is projected to witness the fastest CAGR at over 7% from 2018 to 2024. Superior safety and enhanced aesthetics are among the key factors propelling the steel material demand. Availability of customization to match the interiors in residential and commercial spaces is fueling the industry growth. Additionally, higher strength and durability are among the other drivers the steel fire door business development. Hinged fire door dominates the global fire doors market with over 12 million units sold in 2017 and is expected to continue its dominance up to 2024. Superior load bearing capacity along with easy functionality is stimulating the product demand. Price competitiveness as compared to other products will fuel the product expansion over the next few years. Improves security owing to stringent fire safety regulations on the product will boost the industry revenues. According to the National Fire Protection Association (NFPA), 80 norms have been laid regarding the hinges utilized in fire doors, ensuring the safe functioning of the product. Technological advancements including self-lubricating bearing will positively influence the product development. Technological advancements accompanied by shifting consumer preferences towards enhanced safety and security will surge the fire door business scope. Increasing demand for fire protection products in commercial sector to reduce the loss of lives and property will positively influence the industry growth. Enhanced fire door rating along with features such as lightweight and improved security systems will boost the industry development. Government investments in smart cities and other projects will create new growth opportunities during the forecast timeframe. Expanding commercial segment including hospitality, healthcare, and educational institutions will proliferate the industry revenues. Urbanization supported by booming real estate along with minimum fire safety norms sector will fuel the fire door market size from 2018 to 2024. Increasing industry competitiveness with higher product options available to the customers will strongly support the business demand. Design innovations for better aesthetic appearance along with better fire protection will escalate the market expansion up to 2024. Penetration of online stores offering multiple products including glass, steel, and timber fire doors is creating notable gains in the global market over the forecast timeline. Commercial application dominates the global fire door market and is expected to witness a substantial growth from 2018 to 2024. Expanding new commercial construction along with developing government regulations to reduce the fire incidences are fueling the fire door industry growth. Increasing travel & tourism investments majorly in Asia Pacific and MEA are strongly supporting the product penetration. Internal fire door is projected to witness the fastest CAGR during the forecast timeframe owing to the increasing product installation that adhere to the safety standards. The high demand for doors matching the interior design requirements will positively influence the business revenue during the forecast timeframe. Asia Pacific fire door market holds a significant share and will witness significant gains at around 7.5% from 2018 to 2024. Rising consumer awareness towards enhanced safety along with developing government initiatives towards reducing the property damage will boost the market growth. Booming residential and commercial construction sector in APAC displays strong potential in the region. The global fire door market is highly competitive with presence of large multinationals along with regional players. The key industry players include Assa Abloy, Naffco, Hormann, Rapp Bomek, Chase Door, Vista Panels, Mesker Door, UK Fire Door, and Nihon Funen. Other prominent manufacturers are Buyang Group, Fusim, Agta Record, Taotao, and Jia Hui Doors. Door design, configuration, and after-sale service are the key concerning areas for industry players. Mergers & acquisitions along with expanding the distribution network will be the key strategies for industry players to enhance their market share over the forecast period. For instance, ASSA Abloy is focused on market expansion through strategic acquisitions in new geographical markets.